What happens when you combine two recipes? You create a fantastic flavor combo! (Place the pork in a Ziploc bag with the above and leave refrigerated as long as possible preferably overnight). In a small bowl mix Garlic powder, onion powder, celery salt, black pepper, 5 spice, thyme, parsley, and olive oil until combined and rub it onto the pork. 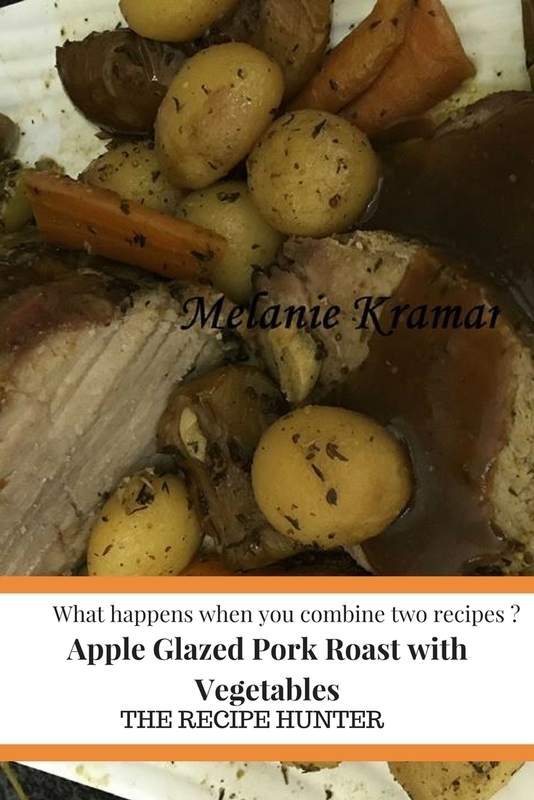 Place pork in a roasting pan and arrange vegetables and apples around it. Season the vegetables with the same rub as well, adding the chopped garlic in between. Mix the beef stock and the apple cider vinegar and pour around the pork and over the vegetable (do not pour over pork). Heat apple jelly in the microwave until melted. Stir in the mustard and pour half the sauce over Pork. Cover and roast at 180 for an hour. Remove and pour the other half of the applesauce over and roast uncovered for another 15-20 minutes. If you’d really like to kick it up, make a roux and add PAN JUICES and some red wine and let it reduce, stirring often to make a nice gravy!